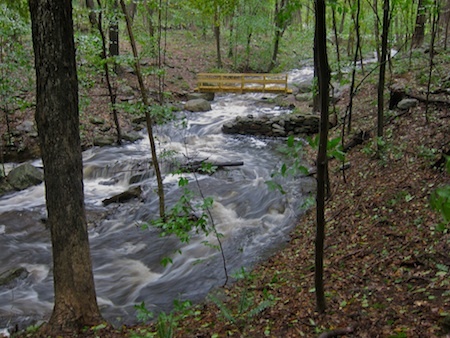 Hurricane Irene roared through here earlier this week. 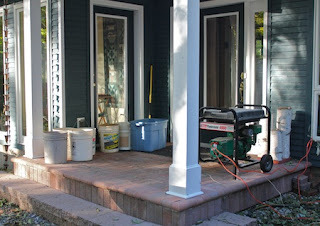 We are still without power and sustained very little damage personally and for this I am grateful. Because we live in a rural, sparsely populated area, I expect we will be one of the last to have power restored so we are developing coping systems. 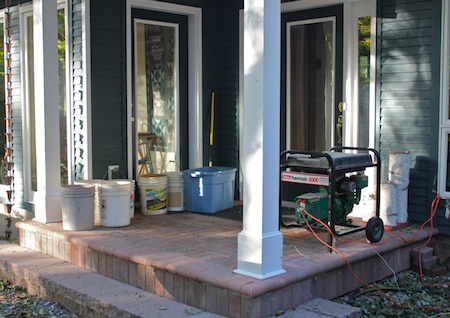 We do have a generator but the house isn't wired for it so it isn't hooked into our systems. That means no water, septic or stove but lights and Internet! That said, the loss of routine and the challenges have certainly impacted my blogging but here are a few photos from the week. 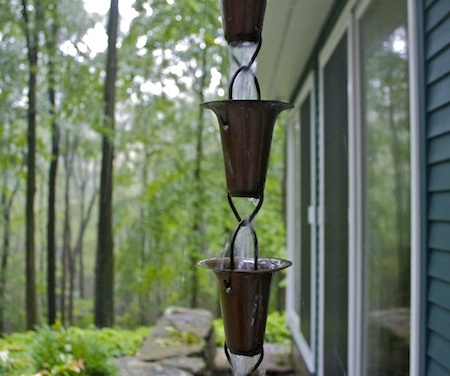 First a photo of our rain chain in action. 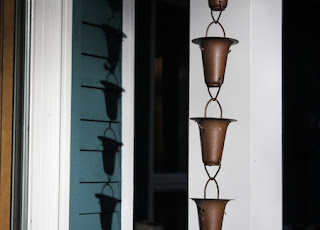 I blogged about Rain Chains earlier as the hurricane was arriving and they really do work quite nicely. And then here they are once the sun came out again. 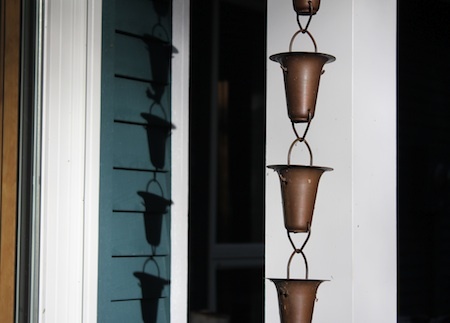 I like the visuals of rain chains much more than traditional downspouts. Shortly after the winds died down we went out to survey the damaged. We lost a few big trees in the woods and many, many smaller branches. The stream was really churning but the bridge we built together this summer was above the high water mark. We did cable it in place but it wasn't threatened. Even though we have no power, we needed to start daily life again so we rigged up the generator and got water to flush toilets. This is what my beautiful portico looks like for the foreseeable future. It is the staging ground for our meager utilities. 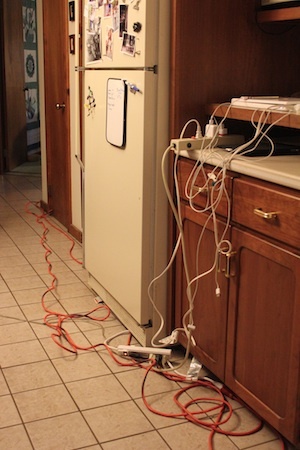 And this is what my kitchen looks like - extension cords everywhere. Certainly not a safe set-up and I am very glad we have no children here! But it is wonderful to have lights, charge up the computers, iPads and cell phones, and be able to make a cup of hot coffee! 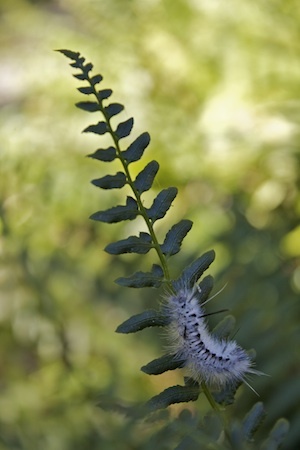 And after it all I noticed this little fellow hanging out in our fern garden. It is great to see the sunshine! My thoughts and prayers to all those that are experiencing difficulties from this storm and the aftermath. And my thanks to the utility crews out there working to restore power!